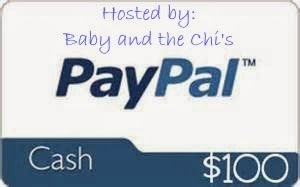 Welcome to the $100 PayPal Cash Giveaway! Co-Hosted by: Journey To Jhady's World, MapleMouseMama, The Pajama Mama, & Life With 3 Boys & 1 Girl. Spring is right around the corner, and how nice would it be to have an extra $100 to plan a nice warm weather activity for the nice days to come, or even just to pamper yourself and take a break from the cold! I'd love to spend a night or two at a nice warm hotel with a pool right now. What would you do with the money if you won? One lucky winner will receive $100 payment via PayPal. This giveaway is open worldwide to all persons age 18 or older. Prize will be paid out as $100USD, international winners will receive that equivalent. Giveaway will be open through February 28th of 2014. Please enter via the Giveaway Tools form below. I would take my husband out for dinner. It's been a while since we have done anything just the two of us. If I won, I would like to take my family for a movie and a dinner. We have not done it for a while and I am pretty sure my kids will be happy and hubby too. Just learned about your site! Love the adorable dog. Entered the paypal contest! I would buy DMB concert tickets for this summer. I wanna buy a smartphone! $100 would come in handy. You really have a great blog filled with giveaways and info. Thank you so much for the chance. I would spend it on my dog's vet bill. I'd use it to pay some bills. I would use it for train tickets to NYC. I would spend it on my current shopping cart at some online store or another~! I'm saving to buy furniture and stuff for my new house. I would spend it to buy myself a new pair of boots! I would save it for a next vacation! I would save the money towards my sons' college fund. Thanks for the opportunity! We are saving every dime for a house. We are looking forward to hopefully moving in six months. ekk! I'm spending it on pen, pencils and books to donate it to children who are in financial needs! I would use it on new boots, which I desperately need as I am a dog walker. I will use for buy food and pay bills! I would put the money toward a new Birkey water filter. I would spend the PayPal prize on my husband! He desperately needs new work clothes! If I win I will use it to go out for sushi! I would buy 2 bottles of Wray&nephews white rum and 2 bottles of Way&nephews red label wine!! I'm saving up to buy a smartphone. I would use the money for new clothes. I hate to shop for clothes but this would leave me with no excuse. i would buy baby clothes for my 9month old baby girl. I'm saving up for a camera, so it'll go there. I would get banquet clothes for my eldest daughter and costumes for my younger daughter's upcoming school play. I'd buy a birthday gift for my best friend. I'd use it for food at the end of the month for my family. If I won, I would spend it on my kids. I would really like to get some clothes! I would use it to buy a gift for a friend that has a birthday coming up soon. I would buy some movies and books. I'd put it toward a computer for my son. If I would win, I would spend it on books, clothes, and something fun to do together with my sister. I'd buy skin care products. I would buy some winter boots, mine are over 10 years old. I would put it towards my schooling. If I won, this would go toward a new bathroom floor, or pay off debt. I would save to get a KitchenAid stand mixer! I would buy something pink and sparkly. I'd spend it on clothes. I have an upcoming wedding and could use a new dress for it. If I win I will donate the money to one of the volunteer-run animal welfare groups in my neighborhood. I would spend it on my granddaughters birthday which is in March. I probably won't win because I can't stay here for an hour making comments. So I will lose points, but that OK.
if i win i will spend it for my baby's need and stuff. i will also give some for my parents. I'd be purchasing a new tablet. Perfect for people who's always on-the-go like me. I'll purchase a new tablet, so that I can browse sites and read my fave eBooks anywhere I go. I'd spend it on stuff for the kitchen. I would spend it on a gift. I'd spend it on a gift. I would buy chocolate and a book or two! I would buy summer clothes for my sons if I won, thanks for the chance. I would buy summer clothes for my sons thanks for the chance! Will add to my current balance for a much awesome buy. Save it for an upcoming trip! I really need to stock up on some basics for the household that we have been running low on like paper products, cat litter, batteries and baking supplies so I would use it for that. I would spend it on my babygirls. I'd spend it on clothes. I really do need to spruce up my wardrobe. I would put it toward a laptop....mine broke long ago and this desk top just ain't cutting it. I would spend the money on organizing and storage containers to contain my sorted stuff. I would buy new toys for our 3 cats and new toys for our 7 dogs. The toys without stuffing since they seem to love to pull it out and get it everywhere. I would also buy them new treats. Would love for them to try the quail treats that you blogged about. I would use the money to pay bills. I would want to splurge on something like a nice bedding set or towels, but my finances are very tight these days so I will pay the cable or power bill if I win. Boring, I know. Being responsible stinks sometimes. Bowling stuff or protein shakes for my health.. I would put it towards our spring break expenses! I would pay it on my credit card, thanks for the chance. Also thanks for all the hardwork and giving us this great information we use.